“It was the worst of dinghies, and it was the best of dinghies” Sincere apologies to Charles Dickens. When I bought Britannia it didn't have a dinghy, but it had very sturdy aluminum davits just waiting for a new “dink.” I soon began to look into specifications and costs for the two main types: RIB’s (Rigid Inflatable Bottom) with their solid hulls; and soft bottom dinghies usually made of PVC. RIBs are great for stability and load carrying, but heavier than soft bottom boats of similar size. A ten foot RIB comes in at around 130/150 Lbs whereas a similar size soft bottom weighs about 80/90 Lbs. Another comparison is the material used for the inflatable tubes. There are two types: PVC and Hypelon. PVC is a thinner than Hypelon, with less abrasive resistant qualities and resistance to sunlight. Hypelon is stronger and resists abrasion and UV light better. Naturally Hypelon dinghies cost more—actually much more—and were outside my budget. 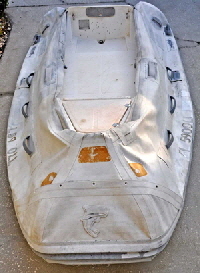 I scoured the web and finally found a 9’6” inch PVC dinghy from Saturn Boats in Miami, Florida. These are made in South Korea, but so was my KIA car, which easily passed 160,000 miles without a splutter. Saturn’s website has a glowing account of how well they are made. (www.boatstogo.com), but I have to admit the greatest draw was the price. At $900.00 with free delivery no other manufacturer came near it. However, one thing I had not considered before I bought the Saturn D250 was how to fit lifting slings to hoist it on the davits. The rear lifts were easy: I fabricated a stainless wire strop, using the clamping tools at my local West Marine store, then bolted it through the transom with U bolts. It was the front that presented a problem, because there was nothing to attach a strop to in the bow. I didn’t consider the two rings on each side to be strong enough to lift and hold a swaying dinghy, which was the correct decision in retrospect. I therefore cut and trimmed a sheet of half inch plywood to fit under the inflatable floor, then led 1” inch webbing straps under the plywood and up inside the tubes, attaching the ends to the carbine hooks on the davit hoist. I also bought a cover to protect it from the harsh Florida sunlight, but it was very awkward to stretch over the front and rear of the tubes while the boat was in the water, then hook it to the lifting lines through the grommet holes I had sewn in the cover. More than once I nearly fell in, leaning over to try and stretch the cover over the rear tubes. I finally made this much easier by stitching two zips in the cover to make a wide flap in the center. I can now fit the cover over the ends, then zip it up when it is on the davits. I didn’t actually use this dinghy much for two years, because I was making all the other extensive refits to Britannia, and we weren't planning on going anywhere. I began to notice some of the pads were coming unglued from the dinghy tubes, and within a short time some fell off completely. Eventually an oar-lock pad fell off, so we were unable to row. I tried to glue them back using PVC dinghy glue, but without much success. Seam leaks also began to appear and the inflatable floor would not hold pressure, which meant my forward lifting strop failed. By this time the boat was out of warranty, but I still called the manufacturers agent in Miami. His first response—after he reminded me the boat was out of warranty—was to tell me, “You must expect this to happen in Florida heat.” I sent them pictures and after a lot of haggling they gave me a $200.00 refund, and I was on my own. Needless to say, I don't have a very high opinion of Saturn dinghys. I never did manage to get the thing completely repaired, and finally accepted an offer from a fellow boater to buy it cheap, “as is,” which left Britannia once more dinghyless. I decided to try my luck posting an add’ on the Cruising Forum website, asking if anyone had a small used RIB for sale for around $500.00. I can't say I was very optimistic, because used RIBs usually go for more than that. 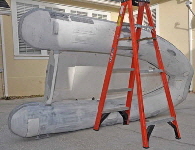 I was therefore pleasantly surprised to receive a reply from Chris Critchett, who had an old ten foot Caribe RIB in his back yard in Sarasota, Florida, which I could have for nothing, if I picked it up. The next day I drove 120 miles from my home in Orlando, and picked it up in my mini-van. It was a sixteen year old C10X model and decidedly dilapidated, but I thought of the old adage, “beggars can’t be choosers.” and I publicly thanked Chris on the forum. Only one of the three compartments held pressure. but the fiberglass bottom was in good condition. It cleaned up well after we flushed out a few dead frogs and roaches. For three days I tried to find the leaks, using an air-mattress electric pump and the soap-and-water test method. I got nowhere and finally decided to have it professionally inspected and the moment it was inflated with a commercial compressor to the correct pressure the leaks immediately began to bubble up. One air valve also leaked and four larger leaks needed patches, which I had repaired then and there. Some were not in the seams but in the material itself. These are called bleeds, and permeate through older material and need tackling from the inside, using an internal inflatable boat liquid sealer. 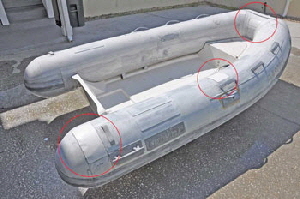 I contacted Dan O’Connell, owner of Inland Marine in Cape Coral, South Florida, who make all sorts of stuff for repairing and restoring inflatable boats. (www.inlandmarine.us). Dan is extremely knowledgeable and helpful, even to the point of advising me of his products, which I did not need. He recommended I start with their internal sealant, which is injected into the boats chambers through the air valves to seal leaks from the inside. I knew roughly where the bleeds were, on the top sections of the tubes. I injected the liquid through the valve into the chambers one at a time, then half inflated the chamber and tilted it so the liquid would run down the inside, to roughly where the leaks were. The sealant is very viscose and “atomizes,” becoming air-born inside the tubes. Where air escapes the sealant is carried along with it, and coagulates in the leaks. Excess liquid dries to a light film on the inside of the chambers, helping to prevent future porosity problems. The instructions said to rotate the boat every 30 minutes to allow the fluid to coat the rest of the inside of the chamber. However, my wife and I found it very difficult to hold this heavy boat in the upright position—until I hit on the idea of using my step-latter to support it. In this way we rotated it 90 degrees at a time, in the hope the liquid would coat the whole of the inside of each chamber, then left it overnight. The next day I inflated it as hard as my air-bed pump would make it, which was not as hard as the manufacturers correct pressure of 0.2 bar (2.9 psi), but I planned to buy a more powerful foot pump once we managed to stop the leaks. After leaving it in my garage for another night I inspected it in the early morning, while the air temperature was still cool. To my pleasant surprise all three chambers were still hard. As days past with no appreciable loss of pressure I became confident the leaks were sealed. I then bought a dinghy foot pump from Defender. Inc. which had a built in pressure gage. This pump enabled me to inflate the boat to the manufacturers recommended pressure for the first time. 3psi may not sound much, but it’s rock-hard, and I had visions of the whole thing exploding and blowing the roof of my garage. The pressure held for the next few days so the next stage was to improve the scruffy appearance. I sanded the whole topsides with 80 grit sandpaper to remove some of the loose paint which had been applied years go. I then e-mailed a couple of pictures to Dan, who suggested I should just paint the boat with their topside paint, available in seven colors. I began by masking all round the rubbing strake, then gave it two coats of blue, using a cheap throwaway brush. I also painted the Dolphin logo on the bow and the Caribe logo on each side, highlighting them with white paint. I then masked off the rubbing strake, the oar-lock sockets and all the handles. I decided to roll the paint over this large area using a 4” inch nylon roller. Two coats covered up most of the scratches and left a very presentable semi-gloss finish. The boat now looked almost new. I visited our local West Marine store once more, where I made two stainless steel wire strops, along with U bolts to attach to the forward locker. The transom already had two U bolts. A RIB is easy to mount lifting strops to the solid hull. The transom drain plug was missing when I got the boat, so I fitted an automatic scupper drain. 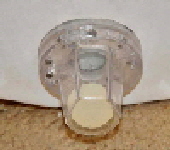 The ball valve prevents water entering, but drains the boat when angled on the davits. This saves having to lean right over and remove the drain plug when the dinghy is on davits. Caribe oars have blades which just clip to the shafts with a spring loaded button, and they were also missing. I contacted Caribe Nautica, Doral, near Miami, Florida, and bought two blades. However, they wouldn't fit the shafts on my older model because there is a lip inside the blade, preventing it from engaging the button in the shaft. I simply filed a very small ridge all the way round the end of the oar shaft to make it slide on. I didn’t like the idea of a single spring button holding the blade anyway, so I also screwed a stainless self taping screw through the blade into the oar, for extra safety. We had a grand launching at the boat ramp near our marina, but I forgot the champagne. Anyway, knowing our luck, if we had smashed a bottle on the bow it would have promptly punctured the dinghy! I then rowed it to Britannia's stern and hooked it to the carbine hooks on the davits. I had not sold the cover from the Saturn dinghy but I had to modify it yet again to fit on the front of the Caribe, which was a bit longer than the Saturn. I fitted press-studs to the flap on the front and the new cover works just as well as it did on the other dingy. The extra weight of a RIB had no effect on my electric hoist, which easily hoisted it out of the water in no time. We had put a lot of elbow-grease and cash into this project, not knowing exactly if it would be worthwhile. But now we have a very strong presentable dinghy, which not only enhances the appearance of Britannia, but which I am very confident about using.